Simply put, teleradiology is reshaping radiology practice. The nerve-wracking part for some radiologists is that they’re not exactly sure whether those changes will help or hurt them. Hospitals face the potential problem of whether new models of delivering services provide the same level of service as traditional practices. Six or seven years ago, radiology was buzzing about image overload and wondering how a shortage of radiologists would handle both the explosion of exams and the growing number of CT and MR images. Back then, image overload was tagged as a major issue for the coming decade. Well, you don’t read much about that anymore, and teleradiology technology and 3D visualization are main reasons for this. As radiologists increasingly incorporated 3D into their workflow, they can now more quickly navigate through the ever-growing number of images in some exams. But probably more important to managing imaging overload is teleradiology technology’s capability to distribute imaging exams to wherever radiologists are available to interpret them. What threatens radiologists is that the image flow can be away from their practices as well as toward them. Organizations such as the Virtual Radiologic Corporation (vRad), Radisphere, and Imaging Advantage are just different efforts to compete in delivering radiology services. Given that the vRad acquisition of NightHawk Radiology Services went down at the end of 2010, it will be interesting and important to see how the now-larger vRad affects radiology practice—and how radiology practices will respond. Diagnostic imaging has gotten more competitive. Potentially, this could manifest the same way as the so-called big box electronic stores stamping out most smaller electronics stores; a small number remain as boutique stores, but the business is forever changed. The same applies to chain stores and neighborhood grocers, home improvement stores and local hardware stores and, of course, Wal-Mart and any number of retailers. But it’s not just retail that’s affected by such competition. Remember when newspapers were the indispensable vehicle for delivering current events and especially local news? Now the entire industry is threatened. Doctors used to talk confidently about how healthcare was the ultimate, inevitable local business. Good care generally requires highly skilled people in a specific location. Telemedicine is nibbling at the edges of that concept across specialties, but radiology is far ahead of the curve in depending less on a physician’s physical location. Teleradiology is the technologic tool that makes it possible. That’s why it bears watching. News reports certainly have discussed it; the public is increasingly aware of it; and the radiology community is tackling how to better manage, measure, and report the radiation dose associated with imaging exams. RSNA and the ACR recently launched their Image Wisely education and awareness campaign. Modality vendors at RSNA 2010 were showing their latest tools for dose management, along with how they envision integrating them into imaging workflow. It’s at least a three-pronged process. Radiologists and technologists need the education to fill any gaps in their education on the topic so they can communicate with patients and referring doctors. The industry needs to make the tools available and provide thorough training for those tools’ use. Imaging directors and managers need to make sure measurement, management, and reporting techniques are built into facilities’ workflow so it becomes a more consistent part of imaging workflow. The federal healthcare reform bill is facing legal challenge in numerous states, including the judge in Virginia who ruled that the requirement to purchase health insurance is unconstitutional. The incoming Republican-controlled House of Representatives may legislatively go after healthcare reform, too, if post-election posturing becomes legislative initiative. Whether Senate votes could be flipped remains to be seen. Even if a new bill of some kind passed, it may be vetoed by President Obama. Many believe the real threat to the reform plan will materialize after the 2012 presidential election. The situation will certainly bear watching in 2011. There have been numerous accounts of people putting off healthcare visits because of insurance issues or general concern about spending in the current uncertain economic situation. Corporate profits have generally improved, but unemployment still hovers at slightly under 10%. A more robust upswing in the economy would help individuals and organizations become more comfortable with spending and investing. GE Healthcare, Philips Healthcare, and Siemens Healthcare all showed PET/MRI scanners at RSNA. There was great interest in the investigational devices that fuse the morphological information provided by MRI and the functional information from the PET scanner. Siemens showed a combined unit with a PET scanner built inside an MR scanner. Both Philips and GE used separate units with different table systems to maneuver the patient between the scanners. 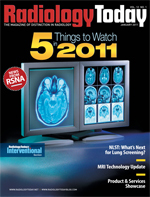 How these systems develop and the ways physicians use them will certainly be interesting to follow in 2011 and beyond. — Jim Knaub is editor of Radiology Today.